Having been a loyal customer for over 10 years, I was BEYOND thrilled to begin the discussion of a brand overhaul with David Squire. His barbershop's visual identity didn't match it's style—they are a very strong, reputable shop specializing in classic men's cuts, hot towel shaves, and beard trimming, but they are unique among their peers because while they take their craft very seriously, they don't bother with all the fuss and pageantry that's so popular in men's barbering today. I felt that their client-facing image undermined their true brand, it didn't convey the level of excellence that Squire is known for, and that was excluding anyone who didn't get a word-of-mouth referral. Focusing on the themes of “personal” and “precise,” We wanted to convey that this was a warm and friendly place where you could experience some male-bonding, but that they backed it up with incredible skill and commitment to time-honored techniques. 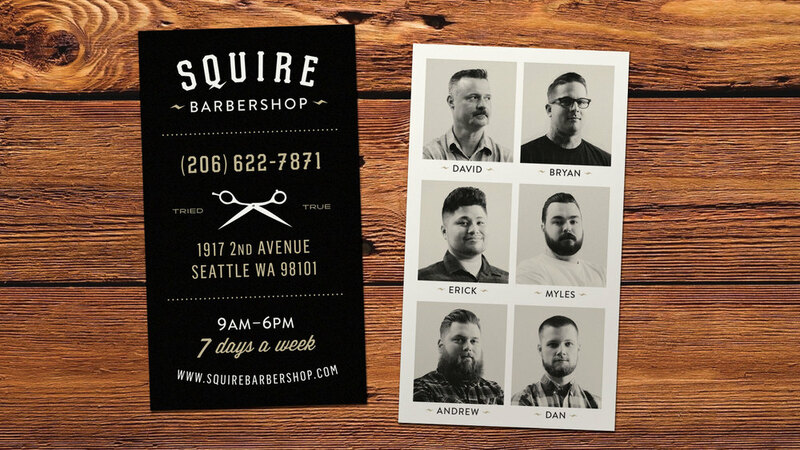 From the business card to the walls, the windows to the website, Squire Barbershop is now speaking to its clientele in an authentic, accurate way. It was an honor to help Squire find that voice.